Background: Patients with chronic kidney disease (CKD) have a high prevalence of cardiovascular risk factors. Cardiovascular disease is the leading cause of death in patients with CKD. Aim: The aim of this study is to determine the prevalence of the various cardiovascular risk factors in CKD patients and compare with that of healthy controls. Methods: A case-controlled study. The study sample included 94 diagnosed CKD patients above the age of 18 years without symptoms of cardiac disease and 70 controls. Fasting plasma glucose, lipid profile, creatinine, albumin, glomerular filtration rate and urinary albumin-creatinine ratio were estimated in participants. Statistical analysis was performed using the Statistical Package for Social Sciences (SPSS) version 20.0. Results: The cardiovascular risk factors found in CKD patients versus controls were hypertension (62.7% vs. 11.4%), diabetes (13.8% vs. 7.1%), dyslipidaemia (50.0% vs. 31.4%), obesity (14.9% vs. 20.0%), hypoalbuminaemia (19.1% vs. 0%), microalbuminuria (55.3% vs. 20.0%) and macroalbuminuria (21.3% vs. 0%). However, only the prevalences of hypertension (P < 0.001), hypertriglyceridaemia (P = 0.007), low high-density lipoprotein (HDL) (P = 0.050), hypoalbuminaemia (P = 0.007), microalbuminuria (P < 0.001) and macroalbuminuria (P < 0.001) were statistically significant. Patients on maintenance haemodialysis had higher prevalence of hypertension (P = 0.018) and hypoalbuminaemia (P = 0.001) than pre-dialysis patients. Conclusion: Prevalences of hypertension, hypertriglyceridaemia, low HDL, hypoalbuminaemia, microalbuminuria and macroalbuminuria were significantly higher in CKD patients than in controls. CVD in CKD is potentially preventable and treatable. This study is undertaken to evaluate cardiovascular risk factors in CKD patients. Prompt management of these risk factors may reduce the rate of CKD progression and development of CVD. This is an observational case–control study. The target population included diagnosed CKD patients (those with symptoms and signs of renal disease and/or GFR <60 mL/min/1.73 m 2 for ≥3 months, with laboratory or radiological evidence) of a tertiary hospital, above the age of 18 years without symptoms of cardiac disease. Sample size was calculated based on a CKD prevalence rate of 3.6% in a Nigerian population  and was estimated at 60 using the formula n = z 2 pq/d 2 and making allowance for an attrition rate of 10%. Ninety-four patients presenting to the haemodialysis unit who were about to start dialysis therapy and those who had already started dialysis therapy were included in the study. Those with acute renal failure or other acute conditions, diagnosed CVD and other chronic disorders were excluded from the study. Seventy controls, drawn from members of staff of the hospital and patients' relatives, with normal renal function and no history of CVD, diabetes, hypertension or other acute or chronic condition were also recruited. Approval was obtained from the Ethical Committee of the hospital, and informed consent was obtained from all participants. Demographic, social and medical data of participants were assessed with the use of questionnaires. The following definitions were used in this study. The CKD stages are Stage 1 – eGFR ≥90 mL/min/1.73 m 2 with kidney damage, stage 2 – eGFR = 60–89.9 mL/min/1.73 m 2 with kidney damage, stage 3 – eGFR = 30–59.9 mL/min/1.73 m 2, stage 4 – eGFR = 15–29.9 mL/min/1.73 m 2 and stage 5 – eGFR <15 mL/min/1.73 m 2. It is defined as systolic blood pressure (BP) equal to or above 140 mmHg and diastolic BP equal to or above 90 mmHg. It is defined as a fasting plasma glucose (FPG) ≥7.0 mmol/L. It is defined as body mass index (BMI) ≥30 kg/m 2. It is defined as any one or more of hypercholesterolaemia (plasma total cholesterol ≥5.2 mmol/L), hypertriglyceridaemia (plasma triglyceride ≥1.7 mmol/L), high low-density lipoprotein (LDL) (plasma LDL cholesterol ≥3.4 mmol/L) and low high-density lipoprotein (HDL) (HDL cholesterol <1.0 mmol/L in men and <1.3 mmol/L in women). It is defined as plasma albumin concentration below the lower reference limit (laboratory reference range = 35–52 g/L). A urinary albumin-creatinine ratio (UACR) of <30 mg albumin/g creatinine (3.4 mg albumin/mmol creatinine) was regarded as normal. Microalbuminuria was defined as a UACR of 30–300 mg/g (3.4–33.9 mg/mmol) and overt albuminuria (macroalbuminuria) as a UACR of >300 mg/g creatinine (>33.9 mg/mmol). BP of each participant was measured with a mercury sphygmomanometer after 10 min of rest on two occasions. Participants were weighed bare footed and wearing light clothing on a weighing balance placed on a flat surface. Their heights were measured on a portable collapsible stadiometer, and BMI = weight/height  was calculated. After 10–12 h overnight fast and observing aseptic procedure, freshly voided spot mid-stream urine was collected from each participant in a plain bottle for determination of UACR. Ten millilitre of venous blood was drawn from the antecubital fossa of each participant into a fluoride oxalate bottle for FPG analysis, an ethylenediaminetetraacetic acid bottle for analysis of lipids and a plain bottle for the estimation of serum creatinine and albumin. Plasma/serum was separated from blood cells after centrifugation at 2500 g for 10 min, harvested with a clean Pasteur pipette and stored at −20°C. Urine and serum creatinine concentrations were analysed using the kinetic Jaffe method, and the serum value obtained was used to calculate the eGFR of each participant using the abbreviated Modification of Diet in Renal Disease formula: 32788 × (serum creatinine in μmol/L)-1.154 × (age)-0.203 × 1.210 (if black) × 0.742 (if female). Estimation of FPG was done using the colorimetric glucose oxidase method, urine and serum albumin by the bromocresol green method, HDL cholesterol by precipitation technique, total cholesterol and triglyceride by enzymatic method  and LDL cholesterol was calculated using the Friedewald's formula. Statistical analysis was performed using the Statistical Package for Social Sciences (SPSS) version 20.0 (SPSS Inc., Chicago, Illinois, USA). Frequencies and percentages were obtained for categorical variables. Differences in proportions were analysed using the Chi-squared test. The means of continuous variables were compared using unpaired Student's t-test and expressed as mean ± standard deviation. Pearson correlation statistics were used to assess the relationship between variables. P ≤ 0.05 was considered statistically significant in all the analyses. The study sample included 164 participants composed of 94 CKD patients and 70 controls. The CKD patients were composed of 40 (42.6%) males and 54 (57.4%) females, whereas the controls consisted of 41 (58.6%) males and 29 (41.4%) females. The clinical characteristics of the study sample are shown in [Table 1]. CKD patients were older (P = 0.001) and had higher BP values than controls (P < 0.001). 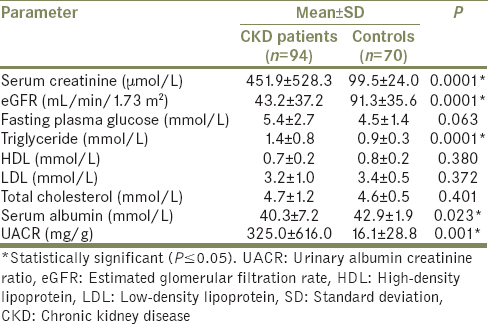 Compared to controls, CKD patients had a higher prevalence of hypertension (P < 0.001), hypertriglyceridaemia (P = 0.007), low HDL (P = 0.050), hypoalbuminaemia (P = 0.007), microalbuminuria (P < 0.001) and macroalbuminuria (P < 0.001) [Table 2]. Details of the biochemical parameters of CKD patients compared with those of controls using the Student's t-test are summarised in [Table 3]. Serum creatinine and triglyceride and UACR of CKD patients were significantly higher (P < 0.001 for all), and their eGFR (P < 0.001) and serum albumin (P = 0.023) were lower than that of controls. There was a negative correlation between eGFR and age of CKD patients (r = −0.358, P = 0.007) and controls (r = −0.346, P = 0.021) [Table 4]. Twenty-four (25.5%) CKD patients were already on regular dialysis while 70 (74.5%) had not commenced haemodialysis. Majority of the CKD stage 5 patients were on maintenance haemodialysis. 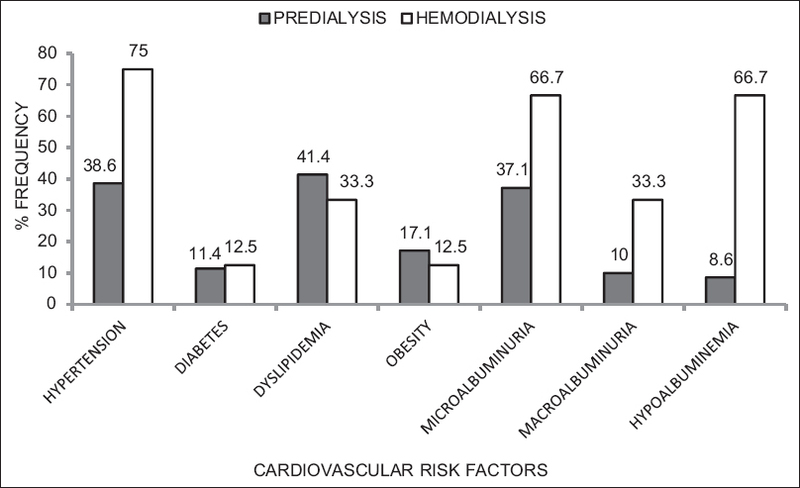 Prevalences of the various cardiovascular risk factors in pre-dialysis and haemodialysis CKD patients are outlined in [Figure 1]. Patients on haemodialysis had insignificantly lower prevalences of dyslipidaemia (P = 0.776) and obesity (0.616). They had higher prevalences of hypertension (P = 0.018), hypoalbuminaemia (P = 0.001), microalbuminuria (0.103), macroalbuminuria (0.164) and diabetes (0.992) [Figure 1]. However, only the prevalences of hypertension (P = 0.018) and hypoalbuminaemia (P = 0.001) attained statistical significance between the two groups. Hypertension had the highest prevalence in haemodialysis patients while dyslipidaemia had the highest prevalence in pre-dialysis patients [Figure 1]. Among the traditional risk factors, hypertension and diabetes are major causes of CKD , and both can result in accelerated atherosclerosis., Fifty-nine (62.7%) CKD patients, compared to 8 (11.4%) controls, in this study had hypertension (P < 0.001). Kidney disease has been documented to have a 5-fold higher prevalence among hypertensives compared with normotensive individuals. Several reports indicate that hypertension is present in 43%–85% of CKD patients and account for about 25% of CKD causes in Nigeria.,, Ulasi et al. reported a high prevalence of 85.2% in CKD patients. Iliou and Fumeronalso documented a prevalence of 25% in CKD and 80% in haemodialysis patients. Similar prevalence of 75% was observed in haemodialysis patients in this study. Hypertension in CKD is usually severe, and it increases pressure overload on the heart. It is a strong predictor of left ventricular hypertrophy (LVH), cardiac dilatation, cardiac failure and IHD., It has been demonstrated that hypertensive patients with stage 2–3 CKD have an increased risk of new or recurrent cardiovascular events  and poor control of hypertension has been associated with increased risk of cardiovascular morbidity and mortality. There is also a blunting of the physiological nocturnal 'dip' in BP which increases the risk for LVH and CVD.,, Lowering BP has been proven to decrease the rate of CKD progression and reduce cardiovascular morbidity and mortality. In this study, estimated creatinine clearance was observed to reduce progressively as age increased, both in CKD patients and in healthy controls. Similar findings have been documented in previous studies.,, Kidney function naturally declines with increasing age, and the incidence of CKD has been documented to be 6–10 times higher in individuals between 70 and 90 years of age than in those between 30 and 50 years. Cardiovascular morbidity and mortality in CKD patients also increase with age. Oluyombo et al. noted that increasing age was associated with increased prevalence of CKD and clustering of cardiovascular risk factors. Age has been shown to independently predict cardiovascular events in CKD patients. Elderly patients (>60 years) with ESRD have been reported to have a higher incidence of CVD. Prevalence of obesity in CKD patients (14.9%) was observed to be lower than that of controls (20.0%). Adejumo et al. also noted that CKD patients had a lower prevalence of obesity (18.4%) compared to controls (21.1%) and attributed this to malnutrition and chronic inflammation in CKD patients. Similar findings were also observed by Oluyombo et al. who documented lower prevalence of obesity in CKD patients (4.8%) than in controls (8.3%). Hypoalbuminaemia is known to be a potent risk factor for cardiovascular mortality and is associated with faster decline in GFR and adverse cardiovascular events.,, Prevalence of hypoalbuminaemia observed in this study was 19.1% in CKD patients, but none of the controls had hypoalbuminaemia. Adejumo et al. reported a higher prevalence of 35.5% in CKD patients and similar findings in controls. Agaba and Agaba quoted a much higher prevalence of 43.2%. Hypoalbuminaemia may be due to proteinuria resulting from the underlying glomerular damage, malnutrition, expansion of plasma volume and reduced albumin synthesis in favour of increased synthesis of positive acute phase proteins due to inflammatory response. Prevalence of cardiovascular risk factors has been observed to be increased in CKD patients. Most of them are modifiable. Early diagnosis and prompt management of these risk factors have been reported to reduce major atherosclerotic events and rate of progression to ESRD in CKD patients., Lifestyle modification, BP and lipid-lowering medications will be beneficial in reducing cardiovascular risk in these patients. Compared to controls, CKD patients were older, had higher mean BP and had a higher prevalence of hypertension, hypertriglyceridaemia, low HDL, hypoalbuminaemia, microalbuminuria and macroalbuminuria. Patients on maintenance haemodialysis had a higher prevalence of hypertension and hypoalbuminaemia but had lower prevalence of dyslipidaemia and obesity than pre-dialysis patients. Early detection, prompt and intensive management of these cardiovascular risk factors will go a long way to slow down the progression of CKD and reduce cardiovascular morbidity and mortality. The authors special thanks and appreciation go to Dr. A. L. Kiyesi, Dr. M. I. Ogamba, Dr. B. C. Amadi, and Dr. T. K. Wala for their invaluable assistance with the data collection for this study. Flessner MF, Wyatt SB, Akylbekova EL, Coady S, Fulop T, Lee F, et al. Prevalence and awareness of CKD among African Americans: The Jackson heart study. Am J Kidney Dis 2009;53:238-47. Zhang QL, Rothenbacher D. Prevalence of chronic kidney disease in population-based studies: Systematic review. BMC Public Health 2008;8:117. Wachukwu CM, Emem-Chioma PC, Wokoma FS, Oko-Jaja RI. Prevalence of risk factors for chronic kidney disease among adults in a university community in Southern Nigeria. Pan Afr Med J 2015;21:120. Alebiosu CO, Ayodele OO, Abbas A, Olutoyin AI. Chronic renal failure at the Olabisi Onabanjo University Teaching Hospital, Sagamu, Nigeria. Afr Health Sci 2006;6:132-8. Afolabi MO, Abioye-Kuteyi EA, Arogundade FA, Bello IS. Prevalence of chronic kidney disease in a Nigerian family practice population. SA Fam Pract 2009;51:132-7. Goicoechea M, de Vinuesa SG, Gómez-Campderá F, Luño J. Predictive cardiovascular risk factors in patients with chronic kidney disease (CKD). Kidney Int Suppl 2005;67:S35-8. Amaresan MS. Cardiovascular disease in chronic kidney disease. Indian J Nephrol 2005;15:1-7. Maharaj S, Naidoo DP. Chronic kidney disease and cardiovascular disease. CMJ 2007;25:384-8. Thomas R, Kanso A, Sedor JR. Chronic kidney disease and its complications. Prim Care Clin Office Pract 2008;35:329-44. Iliou MC, Fumeron C. Cardiovascular disease in chronic renal failure patients. Saudi J Kidney Dis Transpl 2005;16:129-39. Iloh GU, Ikwudinma AO, Obiegbu NP. Obesity and its cardio-metabolic co-morbidities among adult Nigerians in a primary care clinic of a tertiary hospital in South-Eastern, Nigeria. J Family Med Prim Care 2013;2:20-6. Nyenwe EA, Odia OJ, Ihekwaba AE, Ojule A, Babatunde S. Type 2 diabetes in adult Nigerians: A study of its prevalence and risk factors in Port Harcourt, Nigeria. Diabetes Res Clin Pract 2003;62:177-85. Tietz NW, ed. Clinical Guide to Laboratory Tests. 3rd ed. Philadelphia: WB Saunders Co. 1995; p. 365-448. Nalado AM, Abdu A, Muhammad H, Abdu A, Sakajiki AM, Adamu B. Prevalence of risk factors for chronic kidney disease among civil servants in Kano. Niger J Basic Clin Sci 2012;9:70-4. Babua C, Kalyesubula R, Okello E, Kakande B, Sebatta E, Mungoma M, et al. Cardiovascular risk factors among patients with chronic kidney disease attending a tertiary hospital in Uganda. Cardiovasc J Afr 2015;26:177-80. Egbi OG, Okafor UH, Miebodei KE, Kasia BE, Kunle-Olowu OE, Unuigbe EI, et al. Prevalence and correlates of chronic kidney disease among civil servants in Bayelsa State, Nigeria. Niger J Clin Pract 2014;17:602-7. Oluyombo R, Olamoyegun MA, Ayodele OE, Akinwusi PO, Akinsola A. Clustering of chronic kidney disease and cardiovascular risk factors in South-West Nigeria. J Nephropathol 2017;6:196-203. Adejumo OA, Okaka EI, Ojogwu LI. 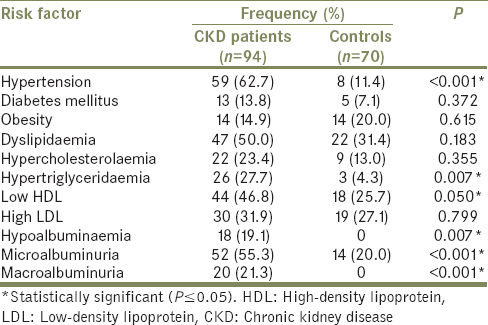 Lipid profile in pre-dialysis chronic kidney disease patients in Southern Nigeria. Ghana Med J 2016;50:44-9. Adejumo OA, Okaka EI, Madumezia G, Okwuonu CG, Ojogwu LI. Assessment of some cardiovascular risk factors in predialysis chronic kidney disease patients in Southern Nigeria. Niger Med J 2015;56:394-9. Chijioke A, Makusidi A, Shittu A, Sanni M, Biliaminu S, Abdul-Rahman M, et al. Pattern of lipid profile in dialysis naive chronic kidney disease patients from Ilorin, Nigeria. Internet J Nephrol 2009;6:1-6. Agaba EI, Agaba PA. Prevalence of malnutrition in Nigerians with chronic renal failure. Int Urol Nephrol 2004;36:89-93. Fraser SD, Roderick PJ, McIntyre NJ, Harris S, McIntyre C, Fluck R, et al. Assessment of proteinuria in patients with chronic kidney disease stage 3: Albuminuria and non-albumin proteinuria. PLoS One 2014;9:e98261.